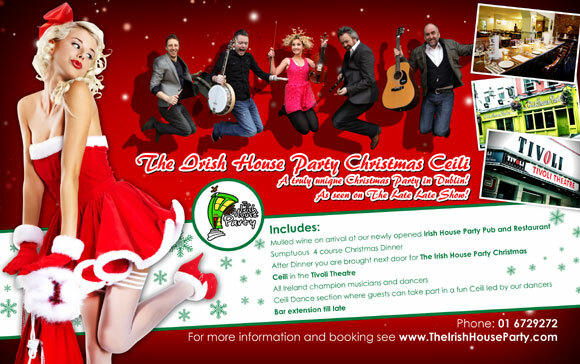 The Irish House Party is offering 4 FREE tickets for their spectacular Christmas Ceili, Dinner and Show, what an unbelievable recession beating Christmas making special. The Irish House Party at 19 Francis Street, Dublin, is Ireland’s leading traditional Irish session venue with Ireland’s leading musicians, singers and dancers performing shows that are unequalled anywhere else in Ireland or further afield. This is your chance to join The Irish House Party for their Christmas spectacular, the 4 FREE tickets include a sit down Christmas dinner in the tastefully decorated Irish House Party pub and restaurant at 19 Francis Street Dublin, followed by a short walk across the street to the fantastic Tivoli Theatre where you will enjoy the greatest traditional Irish session ever. When you have been blown away by the music and the crack in the Tivoli you can return to the Irish House Party bar to enjoy the music of good old fashioned foot stamping pub session with Ireland’s greatest musicians, singers and dancers. This is a session you won’t want to leave and a traditional Christmas you will not forget. Meet Gerry, Declan and all the Irish House Party team, chat about Irish culture and tradition, the Irish House Party team are world class performers, but down to earth people, who want you not only to enjoy Irish culture and tradition but to share their knowledge of music and culture so that your experience is one of learning as well as enjoyment. You can see The Irish House Party Christmas dinner and show on their website and you can view the Tivoli Theatre with their fantastic Christmas Panto, Snow White, also advertised. To enter this draw for 4 FREE Tickets to The Irish House Party Christmas Ceili, dinner and show, simply LIKE Dublin Hotel News on Facebook. All of the LIKES on Dublin Hotel News will be entered into an open and FREE draw, 4 FREE tickets for the Christmas Ceili, dinner and show, remember the tickets may only be used on Saturday the 15th December 2012 or Friday the 21st of December 2012, the tickets cannot be exchanged for money, or any other product or service, if you do not take up the offer as presented then the tickets are void. On Thursday the 20th of September 2012, The Irish House Party nestled at 19 Francis Street, Christchurch, Dublin and twinned with the Tivoli Theatre, launched the revival of traditional Irish music and dance in all its glory. Gone are the big blasts and fads of the Riverdance era and its substitutes, and returned are the soft furnishings, and cosy surrounds of a Traditional Irish House Party. Soon the Theatre echoed with the haunting sounds of hundreds of years of all that is good about Irish Culture and Tradition, music and song were not only played but explained, instruments were not a mystery but visualisations used to explain their time and place in our long rich history. Three hundred year old tunes, that made Leonardo De Caprio and Kate Winslet famous in the great epic Titanic, captured the hand and foot stamping mood of the guests gathered, Bono and U2 echoed from the traditional instruments as easily as the lyrics written by 1916 Patriot and Irish hero Padraig Pearse. A straw poll was taken before the bouzouki and its player told a strange story about a well-meaning rugby player, and this was followed by Gerry telling a story in song, about a yellow haired girl, who may not have been all that she first appeared. The Irish House Party has returned Irish music, dance and culture to its true home, that is home is built from the passion and the love of the few, to be shared with the many. 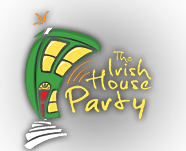 The Irish House Party, above all else offers guests a truly traditional experience, that experience is captured in the ambiance, the food, the service, the passion, and most importantly a true Cead Mile Failte has been returned to the Irish session by world class musicians and dancers.